For all who love the greens, the game that challenges them the most and the unending tirade of excitement it brings-this is one of the most addictive of sports whose love defies simple expression. A wonderful means of expressing that love is this sign board which tries to enunciate why you feel most deeply in your heart. 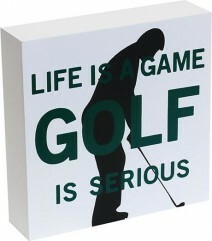 Be the first to review “Serious Golf Sign” Click here to cancel reply.